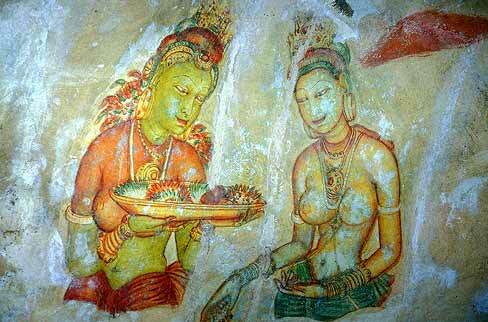 Sigiriya: Who are these maidens and what is their message? Tara is a goddess who was worshipped by Mahayana Buddhists in Sri Lanka. The divine females at Sigiriya are splendidly adorned with jewellary, bracelets, necklaces, tiaras, diadems, chaplets of flowers and are of three complexions red, yellow and green. The goddess Tara too has numerous manifestations in regal splendor and may be of red, yellow, green, blue or white complexion. The Sigiriya maidens have caused much debate, discussion and disagreement. Who are these ladies? What is their message? These are questions that have eluded answers to generations of scholars and art lovers. H.E.P. Bell believed that the paintings were of the ladies of Kasyapa's court in a devotional procession to the shrine at Pidurangala. Professor Senarat Paranavitana suggested that they represented Lightning Princesses (vijju kumari) and cloud damsels (meghalata) Dr. Ananda Coomaraswamy identified them with apsaras in keeping with well established South Asian traditions. Professor Senaka Bandaranayake agrees with Coomaraswamy but adds that the celestial nymphs may have had more than one meaning and functioned as expressions of royal grandeur and status and as artistic evocations of courtly life. In this light of debate it is interesting to consider a theory put forward by Dr. Raja De Silva Commissioner of Archeology of Sri Lanka from 1967-1979. Dr. De Silva says that in 1967 German Swami Gauribala informed him that the paintings were representative of Tara, and Sigiriya. was a Mahayanist Buddhist initiation centre for aspiring bodhisattvas. This theory was later published in Roloff Ben's book Ceylon (1970). Dr. De Silva says that Tara was a goddess worshipped by Mahayana Buddhists at various monasteries in the country. The divine females are shown splendidly adorned with jewellary, bracelets, necklaces, tiaras, diadems, chaplets of flowers and are of three complexions red, yellow and green. The goddess Tara has numerous manifestations in regal splendor and is of red, yellow, green, blue and white complexions. He supports his theory with the description of goddess Tara found in Sudhanamala an Indian Mahayana compilation of prescriptions for the worship of Tara and other deities which throws light on Buddhist iconography . He also points out that the depiction of Tara holding a water lily or a lotus in her hand posture or vitarka mudra is common among the paintings of Sigiriya. Dr. De Silva is also of opinion that the lion symbolism found in Sigiriya is connected with Tara rather than being a mere ornamental, for Tara is likened to a great roaring lion proclaiming the Truth to all. He says images of Tara in association with the roaring lion have been found in India. Dr. De Silva also reminds us that in addition to the paintings of Tara there have been found in Sigiriya a life size limestone statues and also terracotta models of female figures all of which may easily be taken as images of Tara. As such Dr. De Silva concludes that the paintings, almost without exception portray beautiful females. The form, more or less life-size, the blending of mellow colours, the grace of movement captured in an instant but to be held for millennia, lend a feeling of peace and happiness to the mind of the viewer. And the pleasure is enhanced by the suggestion of their being goddesses in the heavens identifiable as Tara. All this create in the mind of the beholder the disinterested or detached judgment that enables the contemplation of beauty to result in the pleasure mentioned above. This then according to Dr. De Silva, is the meaning of the Sigiriya paintings, and the intention of the artist was to make the viewer piously believe in the true beauty of the divine Tara, the Saviouress. The painting of innumerable Taras on the western face of the Remembrance Rock or Sihigiri (as Sigiriya was earlier known by some and which theory is also supported by Dr. De Silva) which the devotees continuously see during the ascent to the summit, is said to have motivated to assist in religious contemplation. And to lovingly adore her and identify themselves with their Saviouress. For they believed that goddess Tara would alleviate their suffering in this world and show them the way to enlightenment. An offering of flowers in Buddhism symbolizes generosity and opening of the heart. Avas Flowers offers beautiful cut flowers and arrangements which can be used for offerings. The lotus flower, synonymous with purity in Buddhist traditions, can also be found at the Avas Flowers online store.